Applied Technologies manufactures professional grade A-Tech Masonry & Brick Sealer. 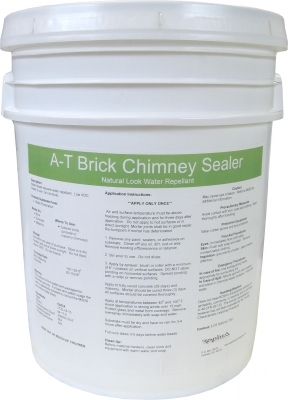 A-Tech Masonry and Brick Sealer is a low VOC water-based silane/siloxane water repellent. This is an environmentally friendly and non-hazardous brick sealer that protects your building, sidewalk, patio or driveway from water leaks. A-Tech Masonry and Brick Sealer is a silane and siloxane blend that penetrates below the surface. It will not yellow, flake or peel. The masonry will maintain its original appearance. Easy clean up with soap and water. Low VOC and low odor formula is environmentally friendly. There are many advantages to using a siloxane based penetrating masonry and brick water repellent. Applied Technologies manufactures quality professional grade sealers that protect your investment. Learn about some of benefits of a penetrating masonry sealer. Chemically Bonded to the Substrate: Siloxane based masonry and brick sealers that penetrate into the substrate have many advantages over surface sealers such as acrylics, silicone and epoxies. The siloxane bonds chemically to the pores inside and below the surface of brick and masonry substrates. This keeps liquid water from entering into the brick. Also, since the sealer penetrates deeply, UV rays cannot degrade the masonry sealer. The penetrating sealer is below the masonry surface so it will give a long life. Excellent for High Traffic Areas: Penetrating below the surface means that high traffic areas like driveways and sidewalks will not lose protection from high use. Surface sealers remain on top of the substrate and are eroded from use. Also the substrate will maintain its natural texture and sheen with a penetrating siloxane sealer. Stopping Efflorescence: Efflorescence is the white color that is seen on many brick and masonry buildings. This is the natural salts that are carried to the surface of the brick by water vapor inside of it. Once the water gets to the surface, the water evaporates and leaves the salts behind on the brick surface. By stopping the water from getting into and penetrating the brick, the efflorescence will be stopped. 100% Breathable Protection: Penetrating siloxane masonry and brick sealers also allow interior water vapor to leave the brick or masonry substrate. This is an important difference between a surface sealer and many other penetrants. A surface sealer will keep interior water vapor that needs to escape inside the brick. In a cold climate, water vapor trapped behind a surface sealer will freeze and cause the brick to spall or flake. Invisible Natural Look Protection: Silane/siloxane water repellents do not stay on the substrate surface. They actually penetrate into the substrate of brick or masonry. To the viewer they are not visible. The brick and masonry will have the same appearance as if it were unsealed. No gloss, shine, sheen or film is left after curing. When a viewer touches the substrate, it will feel the same as if it were not treated.